Raise your hand if you love a thrifty project that requires minimal supplies and less than 10 minutes. I’m practically jumping out of my seat raising my hand over here! 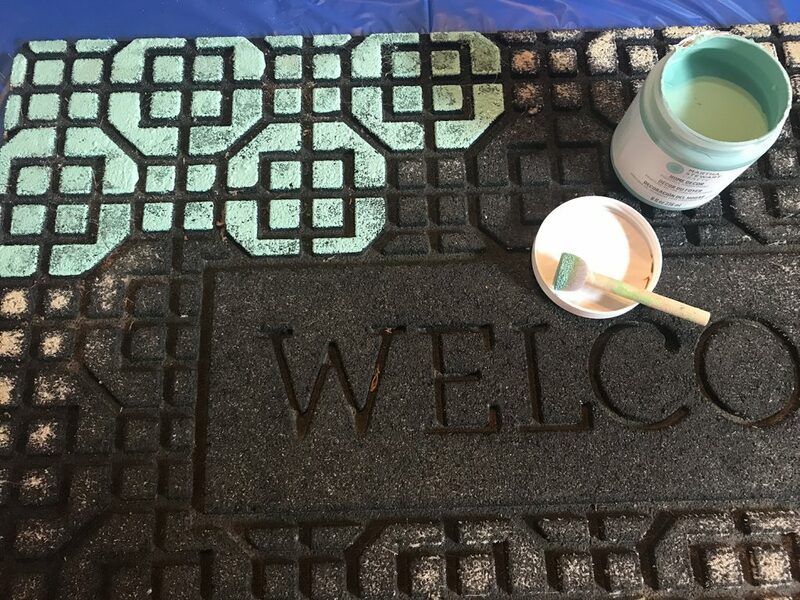 Simple DIY projects are my favorite and this thrifty painted welcome mat definitely fits the bill. 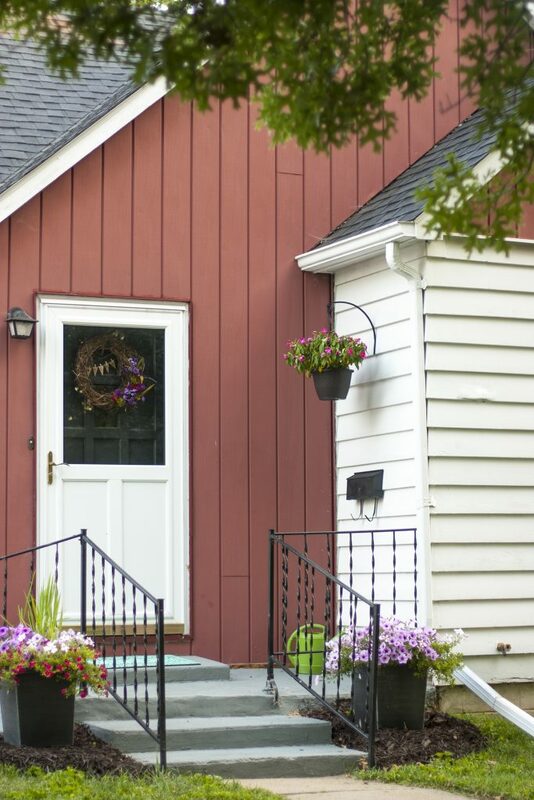 Pre.S – Plan your next home project with the help of the FREE Home Project Planner! Four printable worksheets to help you think through your next awesome project. 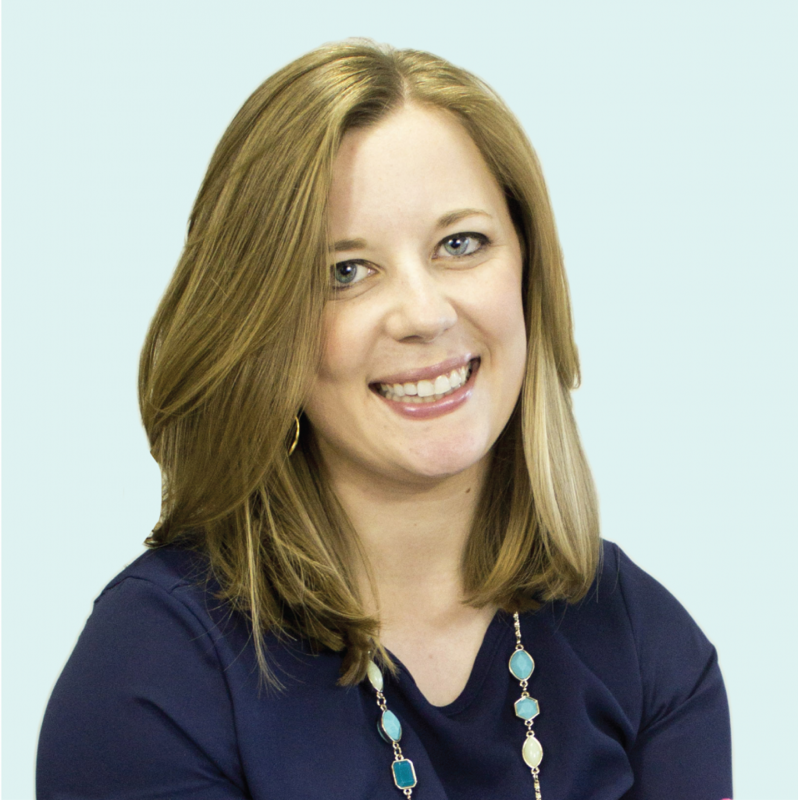 Click here to download your Home Project Planner. Pssst! Pin this project for later so you don’t forget! 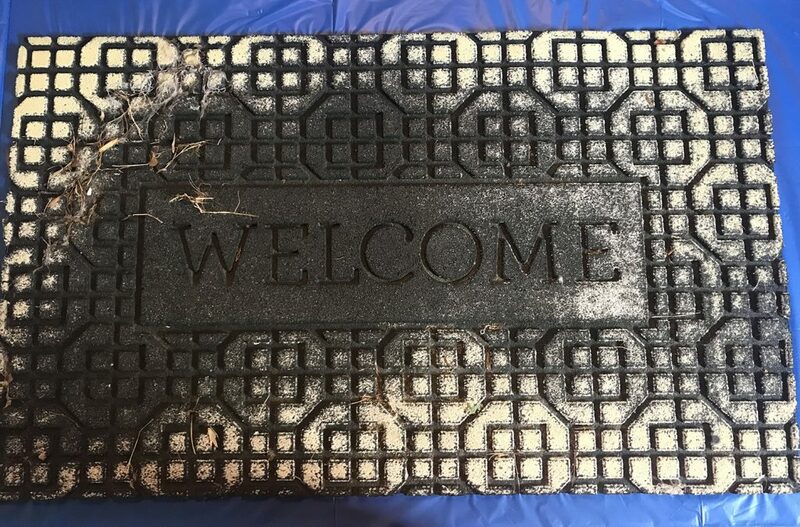 This rubber welcome mat has been sitting in front of our house for the past couple years and it’s obviously seen better days. Almost all of the pretty green has rubbed off, leaving a sad-looking black mat. 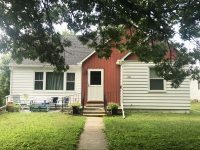 It definitely wasn’t the best first impression of our house. 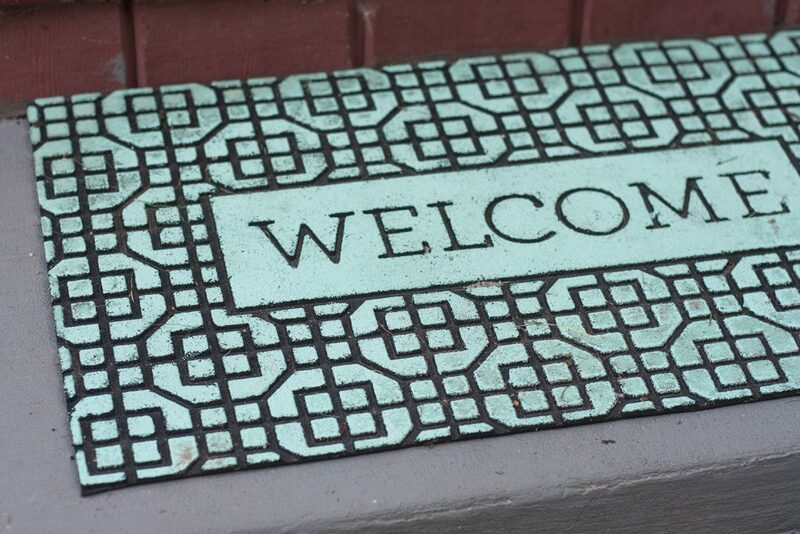 As I began working on some curb appeal projects this summer, I at first planned to purchase a new welcome mat. After all, they’re really not that expensive. But then I thought: Why spend money on something when I can DIY it for practically nothing?! I picked up a jar of this indoor/outdoor home decor paint at Michaels. After a lengthy debate on colors with myself, while standing in the store, I chose a jar of the bright celadon color. After my 40% off coupon, I snagged the paint for less than $5 and have plenty left for future projects! I carried the rug down to my craft studio and cleaned off all the leaves and cobwebs. Then I began painting! I used a round foam brush to dab on the paint, being careful to not drip excess paint down into the crevices of the rug’s pattern. 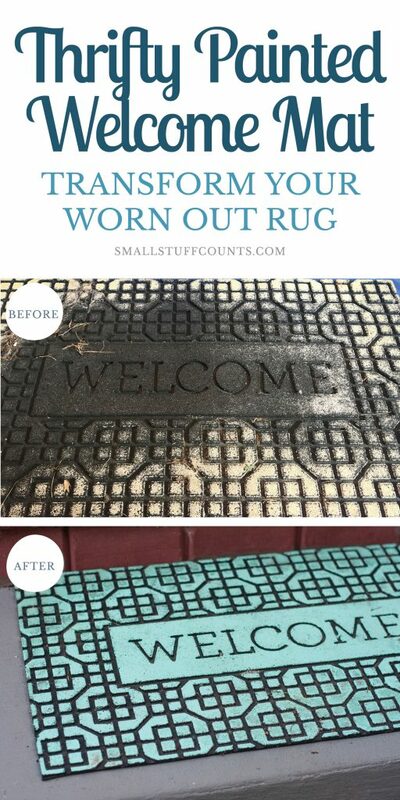 I feel a little silly even blogging about this project because it was so easy, but I want to share my thrifty solution with you in case you have an old welcome mat that needs revitalizing. I worked my way from the top left corner of the mat all the way down to the bottom edge. Check out how much of a difference a little paint made! The rubber of this rug is in good condition so all it needed was a new coat of color on top to make it look brand new again. 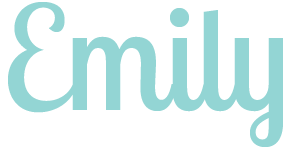 You really can’t mess up this project and it is so low-cost that it’s totally worth giving a try. It literally took me less than 10 minutes to paint the whole thing, then I just left it to dry for a while before setting it back outside of our front door. Check out how nice this painted welcome mat looks now! I only painted one coat mostly because I’m impatient, but it’s held up well for over a week and a few days of rain. This is our main entrance into the house, so we step on it many times every day. It probably wouldn’t hurt to do a couple coats of paint for a more durable finish, but I figure I have plenty of paint leftover to touch things up as needed. I’ll have to report back in a few months and let you know how the paint holds up! This is not going to be a permanent fix for our worn out rug, but it’s so cheap to DIY that I’m okay with it. Plus, I’m pretty sure every rubber welcome mat gets worn out over time anyway so I’d rather spend a couple bucks on paint from time to time than fork over cash for a new mat every year. 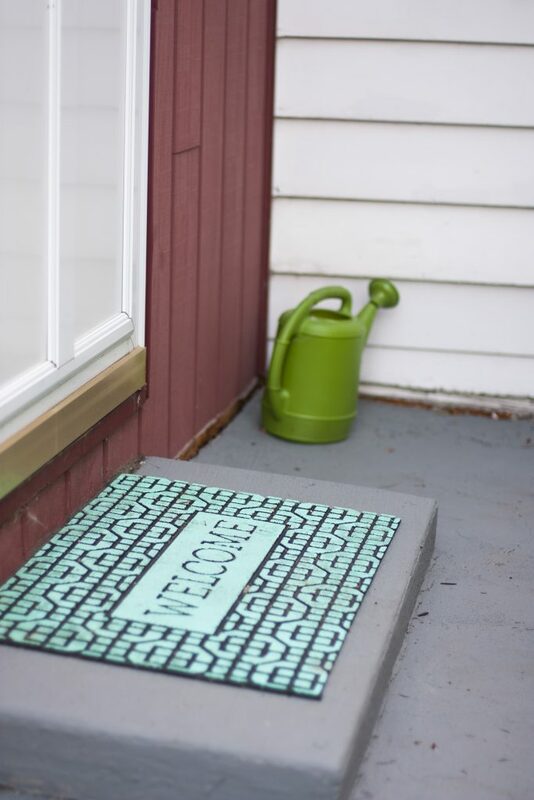 This thrifty painted welcome mat makes a perfect finishing touch to our front steps makeover! I’ve been busy out in our front yard all summer and am so happy with how things are looking now. 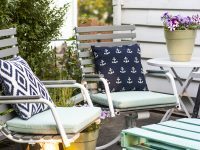 If you missed the full tour of our front patio and curb appeal projects, check it out here! 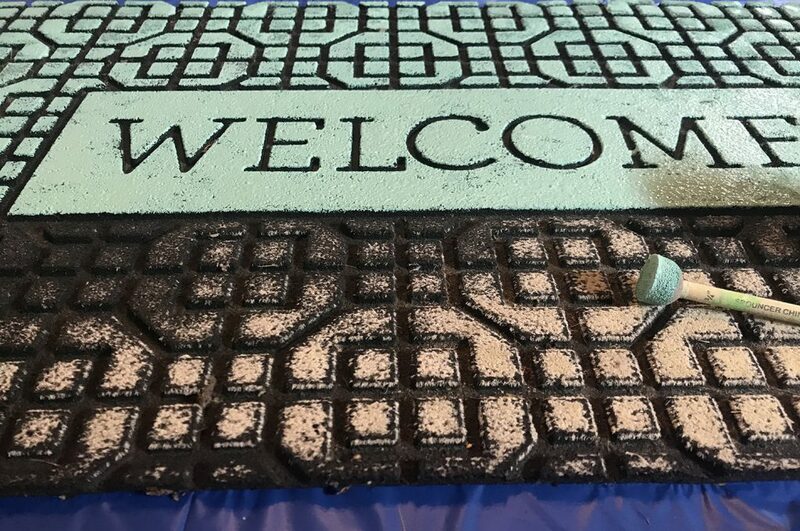 That aqua welcome mat will make a great first impression on potential house buyers that come to tour the house (fingers crossed!). 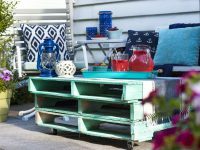 Have you transformed any worn out items in your home lately? I’d love to hear in the comments below! 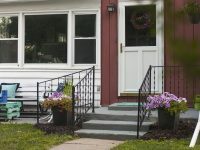 Plan your next home project with the help of the FREE Home Project Planner! Four printable worksheets to help you think through your next awesome project. Click here to download your Home Project Planner. Yours turned out great! It’s got me thinking about if a roller would have worked too? If you just put a small amount of paint on the roller, would missed the grooves? But the cleanup may be more work than the time savings of using the roller. It’s got me thinking about little fixes I can do too! I think a roller might be a great idea, Jenn! As long as you don’t overload the roller with paint, I’d think it would roll on pretty smoothly. Although I’m with you, I probably wouldn’t bother getting a whole roller messy just for that but if you had a mini roller that would probably work pretty well!